I've slowly been collecting more preserved boxwood items. I love the look and how many different places I can use them. I started out with the little mini wreaths a few years ago. I recently rehung them on my secretary glass doors. Then I purchased this large one and have it hung in the hallway leading to our kitchen. But I wanted more! So I found this cute little topiary sized one that fits perfectly in my grey stone pot. And this smaller wreath size that I have lying on top of some old books. But did you know that you have to take care of them? You really can't just go buy them and set them out and expect them to last forever. I found out that you're supposed to mist them about once a month. Kind of like a fern. 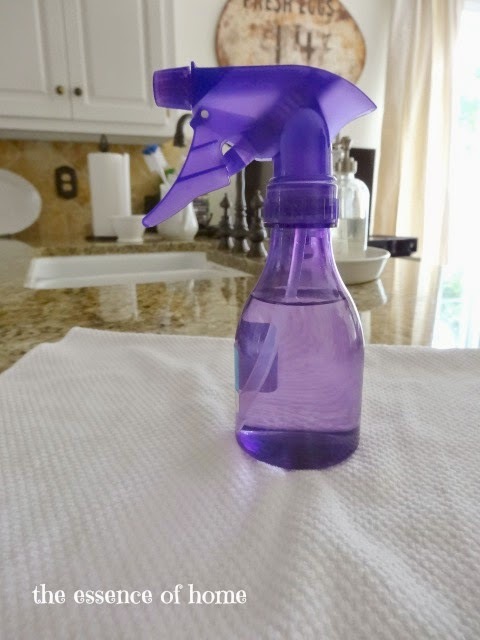 So, I use this little spray bottle to do that. I found this great source for tips on how to take care of preserved boxwood HERE if you're interested. It gives you some do's and don'ts for displaying it and caring for it. Hope you all are having a nice Sunday! My poor son has been covered up in homework every night, including this weekend, since he started 7th grade! I guess it's going to be a loooong year. Your boxwoods are so pretty. 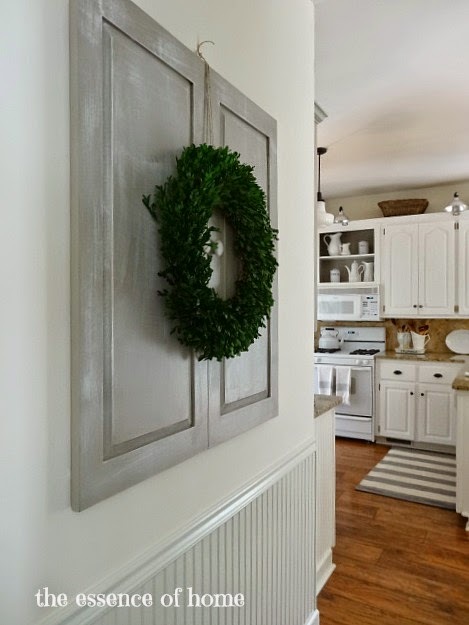 I love the greens with your white and gray color scheme. Your boxwoods look so pretty…I didn't know about misting them either…thanks so much for the info. I don't have one right now, but I'm always tempted to pick one up. They are expensive!! Have a nice Sunday Kelly! I absolutely love the look of boxwood but it isn't that readily available here; and when it is, it is pretty pricey. I had no idea that you had to "tend" it, and I will be happy to know this if I decide to take the plunge & buy some! I really like how you have used your different pieces -- very pretty! 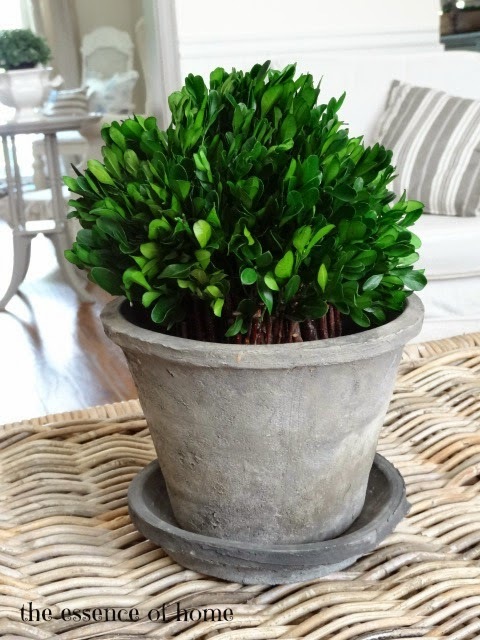 Love the " fresh" look of boxwood greens scattered around the house! 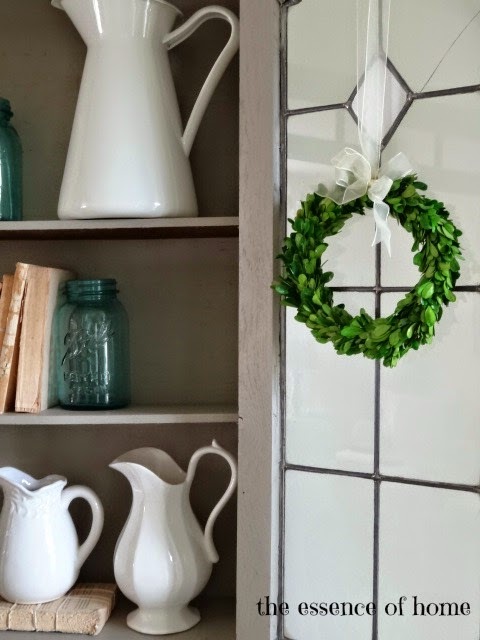 So lovely, Kelly...I always love a pop of green with white! Love the boxwood. School hasn't started back here...they have one more week of Summer vacation. I don't know what it is about 7th grade, but my sons always had lots of homework that year too. Your preserved boxwood is so pretty! I didn't know you actually had to care for them like that. Good to know. I love how you've placed them around the house. I'm finding myself drawn more and more to green in my decor. Hope you have a great week ahead! Your boxwoods looks great. They bring such a pretty natural element to your decor. Your poor son I can't believe school is already this crazy for him. Poor guy. Enjoy the start to this new week. Hi Kelly! I have a 7th grader this year too. We start today. I love boxwood wreaths. I actually looked up how to make them ... doesn't look to difficult. They're so pretty! Have a great week! so glad I read this as I had no idea you have to spray them. thanks for the info. Thanks for the tip, Kelly. 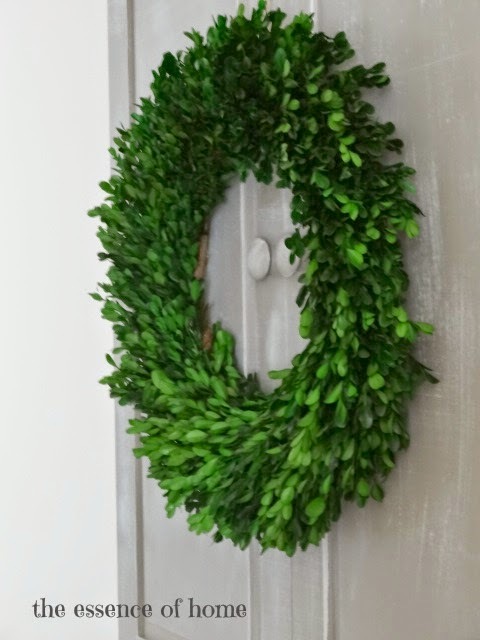 I am going to try my hand at creating a boxwood wreath when I trim the boxwood. I will be misting it! I love using preserved boxwoods and never new you had to spray them. I LOVE the new vignette on your blue chest!! I have started getting more preserved boxwoods as they look great for any season and such low maintenance. I mist my boxwoods once a month but I have found that when you use very warm water, they seem to do a bit better...love how you display your boxwoods! You make me want to head out to find some boxwoods. I love boxwood, too...yours look great! I love how you used the little wreath on top of the books! Good luck to your poor son. The green is a nice touch Kelly ....looks great. Kelly, I love the boxwoods Too. I just recently found out you had to mist them. I've had mine for two years and it has started turning brown. I love those wreaths too! I only have one and it still looks great! I may have to get a few more too,great to have during the drab winter months! My daughter was up until 2:00 a.m. doing her homework the other night! 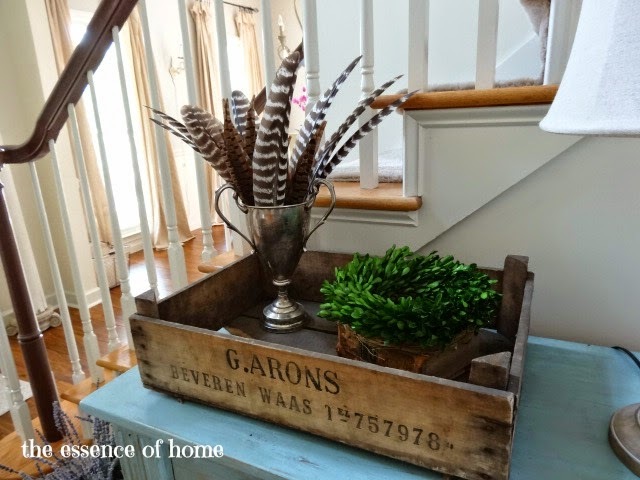 I love the look of boxwood in your home, Kelly! I think I need some of that green in my house. It looks so organic and fresh! I have two mackenzie-childs preserved boxwood topiaries. the description stated that they can be both indoors or out. during the nice weather I kept mine outside, and then brought them inside when it turned cold. I found some black mildew spots on some leaves which was rather disappointing. now that the topiaries have been inside, the leaves appear to be drying up and/or changing color despite misting. do you have any tips that I can use? I love the topiaries and would be extremely upset if I only got one year out of them. In the family of boxwood for sale, box or Buxus there are 110 sizes, shapes, leaf forms and colors to choose from. Plus the alkaloids ... Shrubs For Sale. 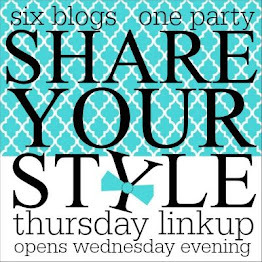 Come Visit Me on my Guest Post!